Former Town academy schoolboy Ben Knight netted both goals as Manchester City beat West Brom 4-2 at home in the semi-final of the FA Youth Cup last night to set up a final against Liverpool. 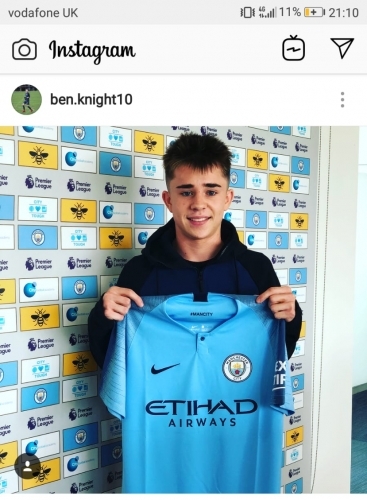 Knight, 16, who opened the scoring in the eighth minute and netted City’s third goal late in the second half, moved to the Etihad Stadium last July for initial compensation understood to be just over £1 million with further top-ups due as his career progresses. The departure of Knight led to Blues owner Marcus Evans publicly expressing his frustration at an academy system which he believes is heavily weighted towards the big clubs with the likes of Town powerless when their promising youngsters attract interest from the top Premier League sides. The Blues have also lost Canadian midfielder Marcelo Flores to Arsenal this season, having seen striker Charlie Brown move on to Chelsea in the summer of 2016. Brown, who hails from Felixstowe, is the top scorer in this season’s UEFA Youth League with 11 goals, five ahead of his nearest rivals. The 19-year-old’s younger brother Zak is currently a first-year scholar with the Town academy, and has scored 14 times this season for the U18s, who currently top the Professional Development League Two South table. Good for him, a loss to us, but hopefully he can go on to have an amazing career. Well we need the top up payments desperately so hope Bens career skyrockets. Only 16 too and scoring loads against the best youth teams in Europe. Zak is also doing well albeit at a much lower level. its about time one or two of our academy forwards became regulars in the first team. The signs are promising and hopefully we will see a lot more of Lancaster, Morris and Folami next season after recovering from their injuries. Sadly, being in League 1 will make it even harder to keep our youth products as even Championship sides will be a bigger draw for them, let alone the lower premier league teams. Let's hope it lasts no more than a season. There are two legs in the semi finals so Liverpool and Man City are not yet through to the final. Good luck to Ben he will need it in Man City academy. If Fodan can't get a start it will be very difficult for any youth player to break through there. We must offer our academy youngsters contracts early to show them we want them to stay with us and progress into our first team. The future at our club looks very good indeed if we can hold on to our young stars. If I’m brutally honest, I do not give a hoot. For Ipswich he is yesterday’s player. Good luck to him but to be honest we have more pressing things to worry about at Ipswich. Not sure what is more shambolic. The way Ipswich is run or the way brexit has been handled. There are 2 leaves here and I wish both would hurry up!! Facup78. It seems the modern way that clubs like Man city and Liverpool snap up the very best 14 to 16 year olds. Invest to make them into complete players for 3 or 4 years. Then send them on loan to Europe, charging huge loan fees. It seems the German Bundesliga cant get enough of our young English players. And as England is awash with the best young talent in the world. Expect to see more of this each year. Although I expect Ben Foden to break into Man city starting 11. As he is a special player. ITFCsince73 I believe the loan structure is changing and clubs will only be allowed to loan out 5 or 6 players so this will massively impact on the young talent in the big club academies. This might stop these clubs taking all the best young talent. Again please correct me if I have this wrong. For his sake, I hope that the lad makes it. Being realistic, his chances of doing so with a club like City are minimal. I suspect that he will either end up making a career at a much lower level or disappearing completely. Unfortunately the development of these young players is not important when the big clubs start waving the cash about some of them come from working class backgrounds and the money is too good to turn down for their families unless the FA bring in rules to stop this like an age limit when other clubs can't approach or lure them away things look bleak for clubs like ours . Ipswich towns success in the past has been down to largely to our youth policy.